The first batch of 35 participants has an impressive profile.Half the class has an average professional work experience of 7 years. Over 65 percent of the students already have an MBA from other B-Schools and over 30 percent of them are engineers. The program has participation from a number of IT and Finance professionals. A large US based financial services MNChas sponsored a few of its employees for the program. A majority of the participants are looking forward to capitalize on the opportunity for growth in the Banking, Financial Services and Insurance (BFSI) sector, in both domestic and international markets. Proposing a vote of thanks, D Ravishankar, Founder Director, Brickwork Ratings,stressed the need for professionals in risk management areas in the commercial banks. He urged the students to make the best use of the opportunity provided by the PGP. 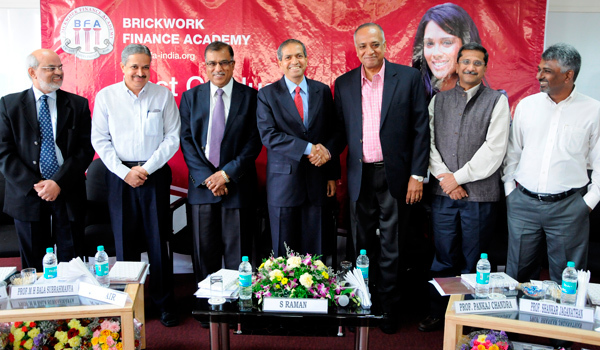 Brickwork Finance Academy is a Bengaluru based non-profit organization that is committed to promote financial literacy and impart practical knowledge in the field of finance. BFA’s PGP is meant for working people aspiring for a career in finance. It is spread over nine months with classes being held on Saturdays. The program comprises of four modules: Basics of Financial Analysis, Investment Management, Credit Management and Risk Management. In addition to classroom sessions, participants are expected to undertake a project work in finance to enhance their knowledge. BFA’s faculty pool comprises of industry experts, renowned academicians, faculty of international repute and successful leaders in the field of finance. The program has been designed to serve the BFSI sector in both domestic and international markets.